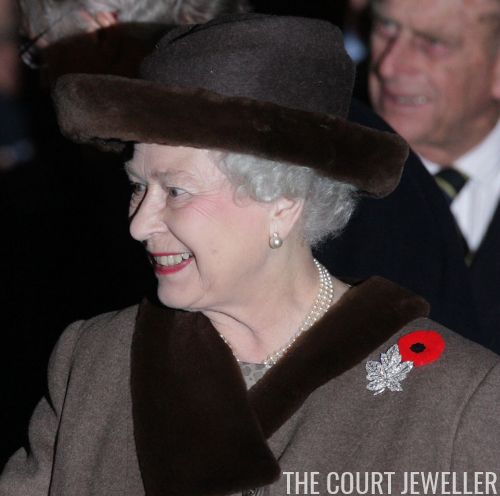 The Maple Leaf Brooch originally belonged to the late Queen Mother. 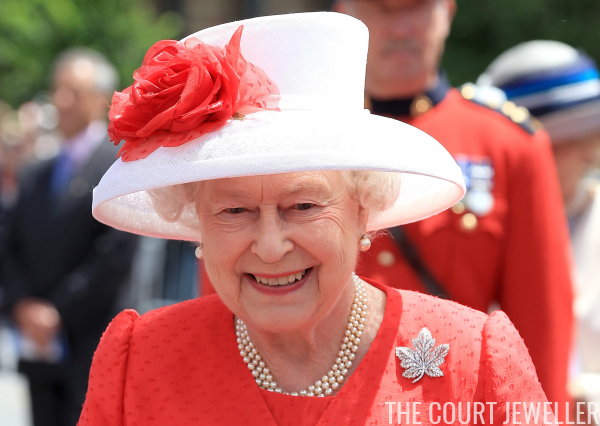 In The Queen's Diamonds, Hugh Roberts explains that the brooch was a gift from King George VI to his wife, Queen Elizabeth (the Queen Mother), in the spring of 1939. The occasion for the gift was an upcoming tour of Canada. The maple leaf is, of course, one of Canada's most important national symbols. 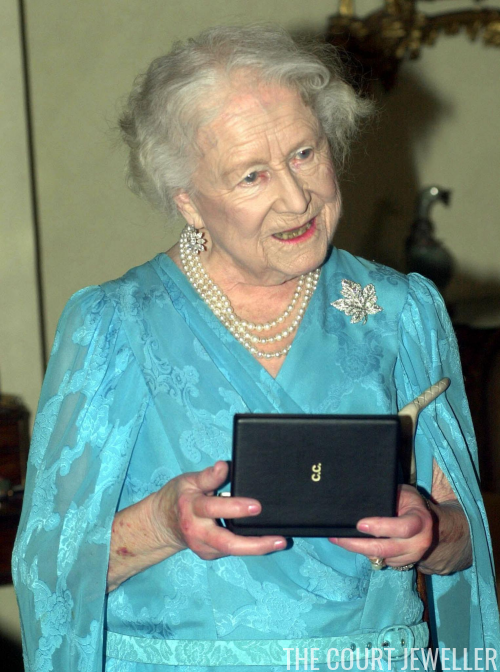 Elizabeth wore the brooch for the first time in May 1939 as they crossed the Atlantic. The Vancouver Sun, however, has published an interview with Joe Hilsted, a Canadian jeweler who notes that his father, William Hilsted, was the maker of the piece. The Hilsted family was originally based in England, and William apparently worked for Shire and Olin, a smaller firm that reportedly constructed the piece, which was then sold at Asprey and Co.
Hilsted offers a rather strange alternative story behind the Queen Mother's acquisition of the brooch. He states that the piece was originally "a double clip" owned by Mrs. George Weston, wife of a British businessman. According to Hilsted, the Queen Mum saw Mrs. Weston wearing the brooch at a garden party and admired it. And then, he says, "Mrs. Weston took it apart and gave half of it to her." This was all, apparently, just before the 1939 tour of Canada. I'm a little skeptical of this part of the origin story. 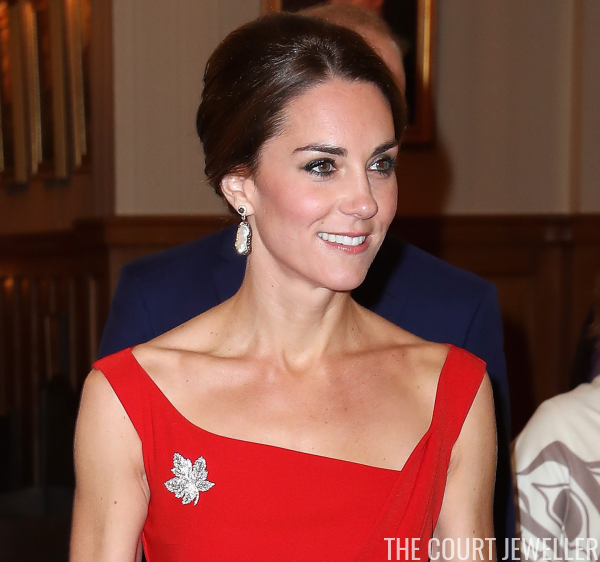 For one thing, the Maple Leaf Brooch is a significant piece of jewelry, and if it were a double clip, it would be so large that I'd wonder if it would really be wearable as a double-clip brooch. (I'm also having trouble envisioning how a double-clip brooch mechanism would attach two similar "clips" together.) The story also seems like a twist on the old Queen Mary story about royals "admiring" objects and then expecting to be presented with them. There's also the matter of two details from Roberts. He links the brooch (albeit speculatively) with a privy purse payment made to Asprey in April 1939. 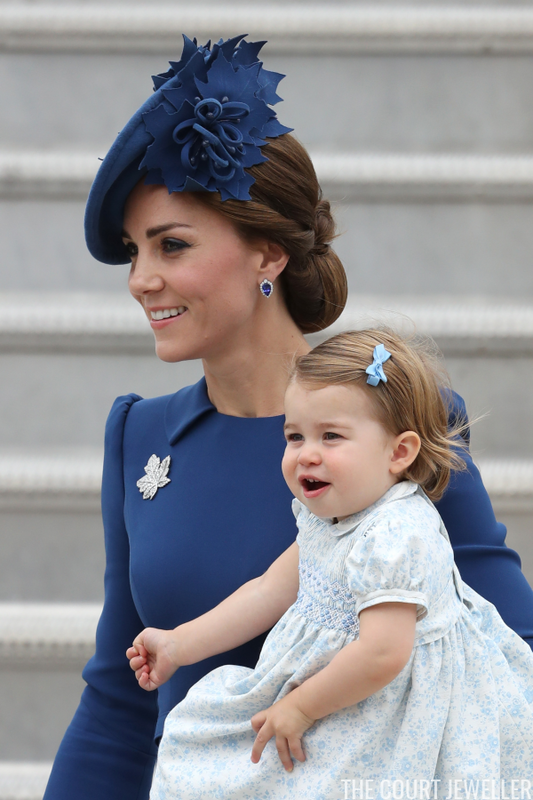 And then there's the fact that the brooch is shaped like a maple leaf. It makes more sense to me that George VI selected the piece specifically to commemorate the Canadian tour. 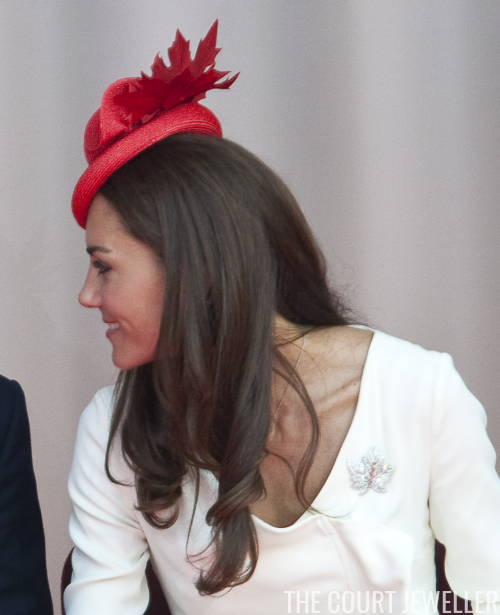 Why would a British businessman's wife have Canadian-themed jewelry? Unless Mrs. Weston just happened, by coincidence, to be wearing a giant double clip featuring the symbol of a country where the king and queen were shortly due to visit...?